Forge construction has changed a lot in recent decades. Products like Kaowool and ITC-100 were adopted from the ceramic and steel industry. We are now taking fiber panel construction methods from the same industries to make better forges. Why change, you say? "Everyone makes tubular forges including several commercial manufacturers". . . But round (a cylinder on its side) is a lousy design except for ONE feature, blanket in an arch is self supporting. Forge floors need to be flat. Hard brick is better than other floor materials but it fits poorly into cylindrical forges. Fired brick is also harder and more durable than cast refractories. So our starting point is the standard 4.5 x 9" (114 x 229mm) refractory brick and multiples of that size. These are our modular forge sizes. 9 x 18" (4 bricks). Now that everything is rectangular we can use a simple lightweight angle iron frame. Our small forges are made from 1 x 1 x 1/8" angle and 1 x 1/18" flat bar. 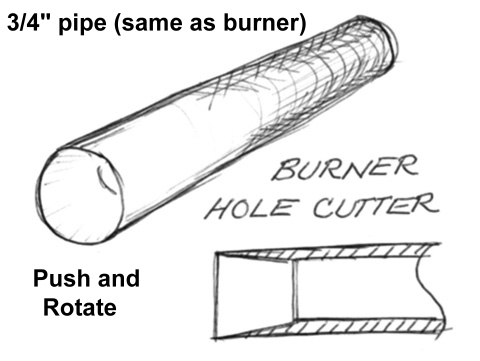 Heavier forges can be made of 1-1/2 x 1-1/2 x 1/8" or 3/16" angle and similar flat bar. Under the brick, we use kaowool refractory board cut in these convenient modular sizes. 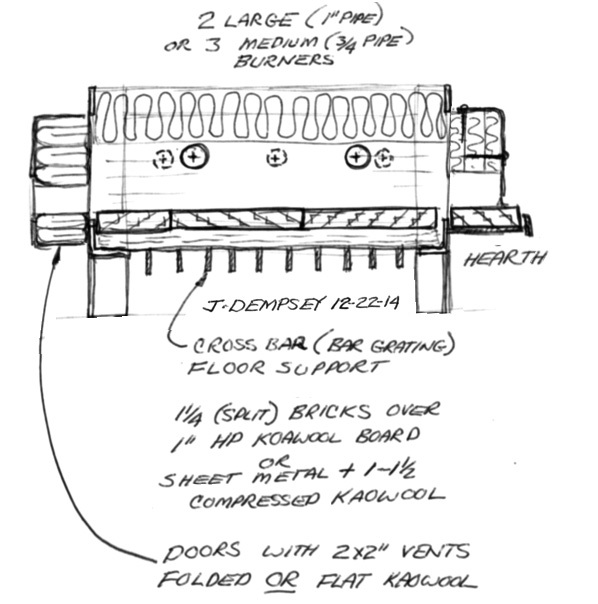 A series of 1" x 1/8" bar arranged like bar grating is used under the insulation board. This allows water, steam and heat to escape while providing strong support for the forge floor. Fiber panels are made of 1" Kaowool blanket folded with a wire rib in the fold and tied to expanded metal. 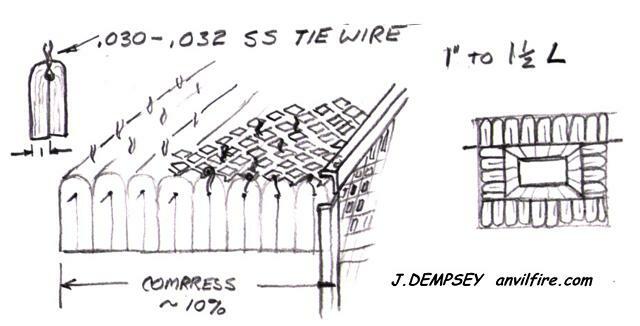 In some cases the expanded metal is not reinforced but most of the time it has an angle iron frame, cross bars as needed and sides significantly shorter than the fiber. These panels often bolt to larger frames to make walls, doors and ceilings. Due to their light weight, fiber panel assemblies are most often used for ceilings. There are modular systems where common 2 x 2 foot panels fit into frames. These modular panels are easy to replace for maintenance and repair. Fibre panels with their end grain exposed to the forge or furnace interior are more durable than flat blanket which is easy to snag and pull apart. In our small forges the expanded metal does not need reinforcing. We bend the ends to trap the fiber blanket as shown below. A snug fit is all that is needed to hold the panels in place. 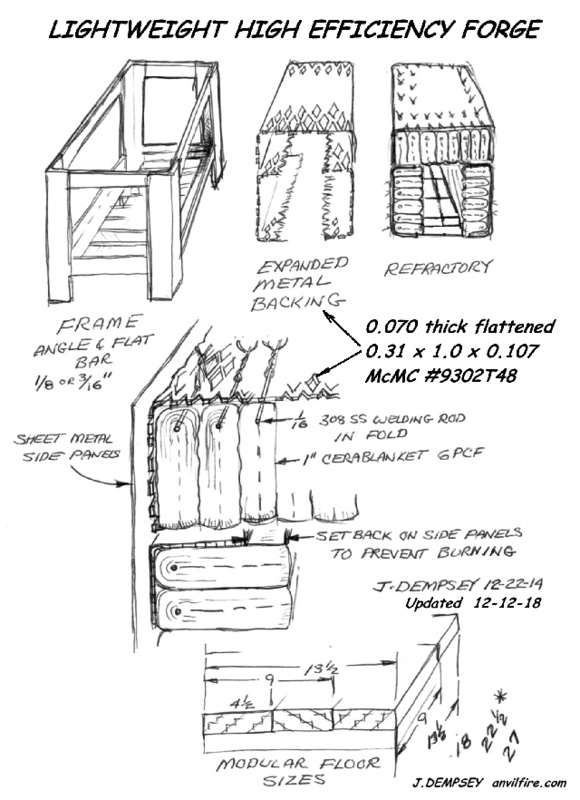 The forge frame size starts with the floor + 2x the fiber panel thickness + 2x some small clearance amount + 2x sheet metal used for the sides (optional). We have made folded walls of 3" but 4" is probably optimum for larger forges. Cut a small piece to determine the folded length for your desired wall thickness. Usually it requires 1/2" extra for the fold. The rib wire is 308 bare stainless welding (TIG) wire. The tie wire is annealed .030" or .032" stainless safety wire. Loops of the safety wire are pushed around the rib wire about every 3 - 4" depending on the size of the forge. These are then tied to the expanded metal. For forge size panels 0.070" thick expanded metal works well. It is easy to cut and to bend in the channel shapes shown. For larger furnaces heavy expanded metal with structural frames may be required. The channel shape of the expanded metal holds the folded material in place and lets you compress the blanket by adding unfolded single strips between folded strips if necessary. These do not need to be wired in as the high friction holds them in place. The channel shape of the expanded metal also stiffens it to make a sturdy flat panel without reinforcement. Using this method to create thicker walls allows the use of the least expensive thickness and density of kaowool blanket (1" 6PCF). When building these panels loose places or gaps occur and are easily filled with a strip of blanket. Note that the supporting stainless ribs and wire are far enough from the hot-face that they are more than sufficient to withstand the heat at this point. Thus expensive Inconell wire is not needed. We support our burners a number of ways. A flange can be welded to the burner and a screw used to hold it in place. A piece of angle iron can be welded to an arm on the frame to create a V for the burner to rest in. Then a hose clamp is used to hold the burner to the angle iron. When using this method the V of the angle is used for a guide when cutting the hole into the panel. 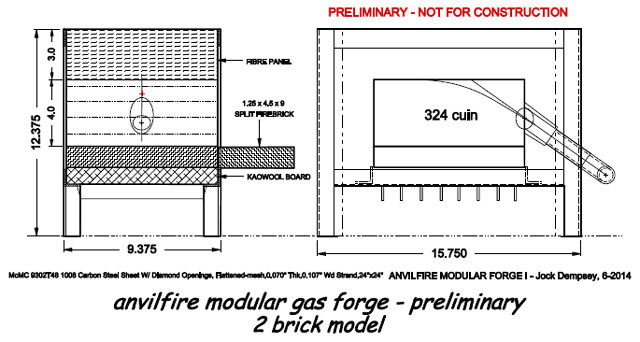 The two preferred burner mounting positions are horizontally or sloping upwards to the middle of the forge roof. Vertical mounting where the flame impinges on the work creates hot spots and scaled work. Thus it is better to mount the burners so the flames do not directly impinge on the work. Our "bent" burners with a right angle in them, tuck right up against the forge when mounted at an uphill angle. 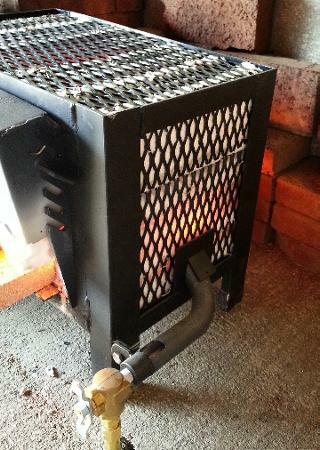 We cut burner holes using a piece of sharpened pipe the same size as the burners. It is sharpened on the inside at about a 5 degree angle. The cutter is gently pushed and rotated to cut the hole. On thick walls the cutter may need to be emptied to complete the hole. After the hole is cut all the way through then a taper can be cut with a slender knife to where the burner stops. We coat the entire interior of our forges including the bricks with ITC-100HT. The only places left bare are the ends and doors when the kaowool to kaowool seal is needed. Kaowool Refractory blanket About Kaowool and brands comparison. Convertible Forge/Furnace A melting furnace that converts to a forge. Coal and Charcoal FAQ Includes types, burning temperature and stacks and hoods for coal forges. Coal Scuttle Coal Suppliers courtesy of the Blacksmith's Gazette. Commercial Charcoal Retort By Andrew Hooper, Kiwi Blacksmith, New Zealand. Örjan's charcoal making method Barrel method with illustration.